OK, it has been a couple week since I last stepped through a "work in progress" (or WIP) map. The big learning event in that post ended up being a surprise to me because it was kindly pointed out (despite my allegations to the contrary) that I could use some of my available tools to streamline the process considerably. In that post we pretty much just went from scanning the crudely drawn in map to getting a good working computer file. This time around though I'm working on a new map, so I've already taken things to this point. It might be important to note that on this map I'm doing things differently in that instead of starting out with a complete drawn out map I have instead elected to draw a bunch of elements that I'm planning on stitching together in Photoshop. GIMP would work just as well, but the commands and toolbars will vary. So I have this digital file that is still rough and I put it through some quick auto-tracing in Adobe Illustrator. There are alternatives to AI, Inkscape immediately comes to mind, but I use the tools I have available. Now when I use the auto-trace I have a vector graphic I can resize however I want. I open up the new file back in Photoshop (much larger than I need to) and I notice that my lines are a bit uneven. Normally not that big of a deal since that can give things more of a hand-drawn look, but I have an idea to make things a bit more uniform. First though I go ahead and use the Paint Bucket to fill in the area outside of my drawings. I undo the fill and take some time to use the virtual paintbrush to close up those gaps. I don't worry too much about keeping it clean because of my next few steps. Re-doing the back fill shows that my shapes are all "intact". Now I go ahead and use the Magic Wand to delete all of my black outlines. This leaves me with a bunch of white shapes on the grey background. 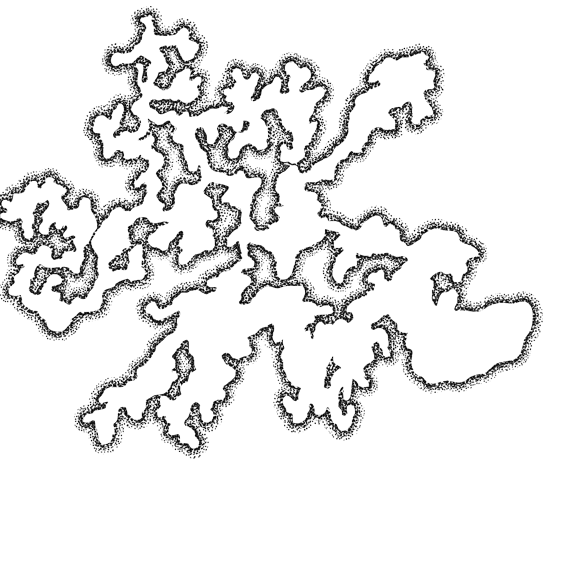 Another use of the Magic Wand and a "similar" selection and I have all of the shapes selected. Now I just have to create a stroke layer and everything has a smooth and consistent black outline. Now the fun part of the mapping can begin. After creating another empty file work-space in Photoshop I go ahead and convert my shapes with a stroke layer into what is called a Smart Object. Essentially it flattens that layer with the special effects into something a bit easier to work with. Using the Lasso tool I start copying elements (shapes) from my one file into the "empty" works-space. Each time I do this it creates a new layer in the second file. Each layer will be a level of my cave. Now something I like to do is go ahead and mark up the first file to note which objects I've already copied. I do this by simply using a colored Paint Bucket to fill in those shapes I've used. I keep copying shapes from one file to the other until I'm happy with what I have. In the second file I go ahead and move & rotate the shapes how I like until I get what I want out of it. Make sure to save your first file so you can access it again later and while you are at it, you should save the second file to mark your Work In Progress. I don't know how many times I've needed to go back to an earlier WIP file to get something, even on this project. 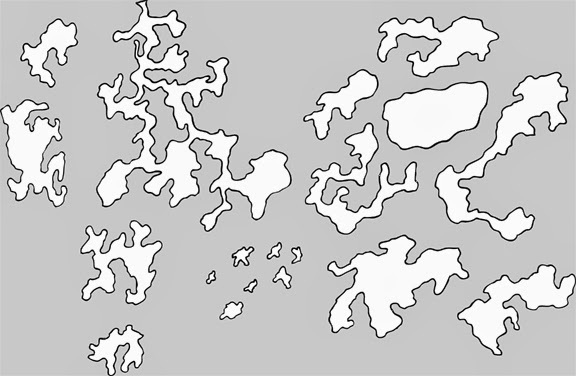 At this point I have a roughed-out cave map. I decided early on that I wanted the levels to overlap instead of having tunnels connecting the various points. I figured there would be simple holes in the floors/ceilings of the appropriate levels to accommodate transitions between the levels. 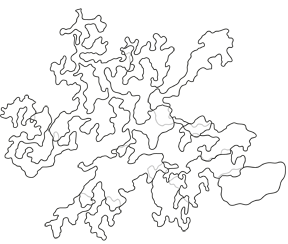 The small objects I drew were actually intended to be these holes, but on my first map I deliberately left them off so the GM could determine these transitions as-needed. What I needed to do was figure out a better way to show the relationship between the levels. On previous maps I'd use dashed lines to depict the boundaries of lower levels. Another option would be to shade the lower levels darker and darker. since I had a backed-up file I tried both options and found them lacking this time around. There were too many levels for the shading option and I had consistency issues with the dashed lines. Since the borders/walls were smooth & consistent the irregularity of the dashes really stood out as "wrong". What I ended up doing was utilizing my Magic Wand tool to select the interior of a shape and then selecting the layer of the level below and using Cut & Paste to effectively "cut-out" the selection of wall that was below the object I had use the Magic Wand on. Then all I had to do was position that small wall section above the first layer (the one I used the Magic Wand on), change the color, and merge with that layer. The way I changed the color was simply by changing the opacity of that small wall section. This was a bit of a pain to do for each layer, but it was relatively quick and consistent and in the end I didn't have any additional layers to deal with. Doing the walls this way enabled me to simply make it appear each layer of the cave was somewhat transparent without actually doing so. The reason this is "important" is because I was going to use my new stippling layers to finish off the map. 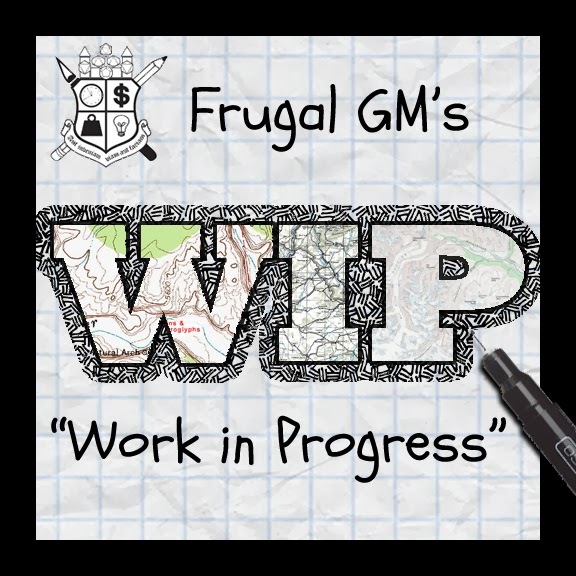 I had to quote "important" because I wanted these individual layers in my WIP file in case I wanted/needed to go back to them, but for my first map it wasn't that big of a deal. 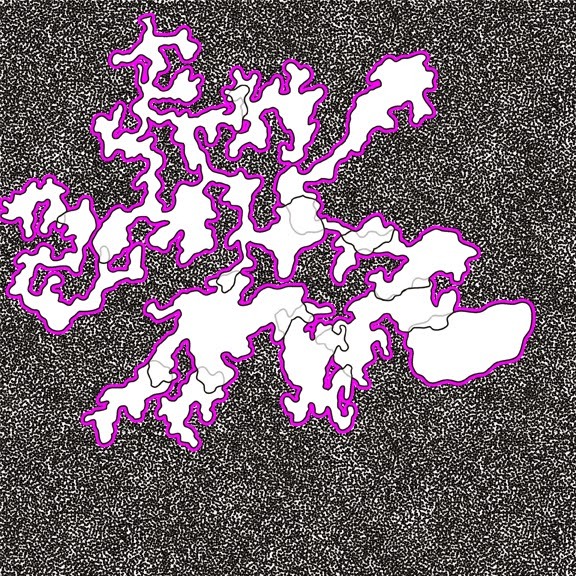 After I had a back-up file I just went ahead and merged all my levels into one layer for stippling. To stipple the map I opened up my heavy stipple file and then Cut & Paste that layer into my working file and moved it below the cave layer. 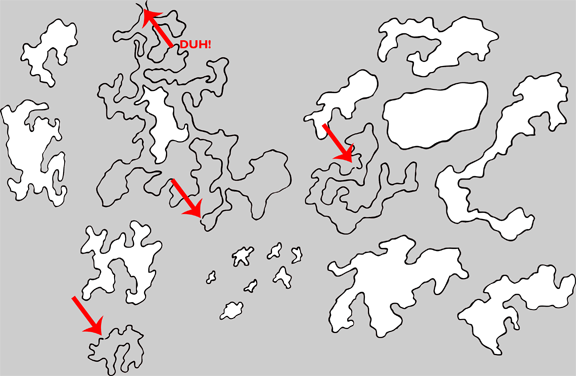 Then I made a copy of the cave layer and made a stroke layer. For the sake of this post we will say I made it s 12px stroke layer. I do make sure to use a loud color for this stroke layer so it is easy to work with. converting the stroked cave layer to a Smart Object (again, essentially flattening it) I can use the Magic Wand tool to select the loud color. Make sure you also right click and choose "Similar" to get all of that color selected. The Magic Wand will only "grab" a continuous band of color, with some allowances for the tolerance level in the Wand's settings. Now that you have all the color selected click on your stippling layer and cut & paste your selection from that layer. 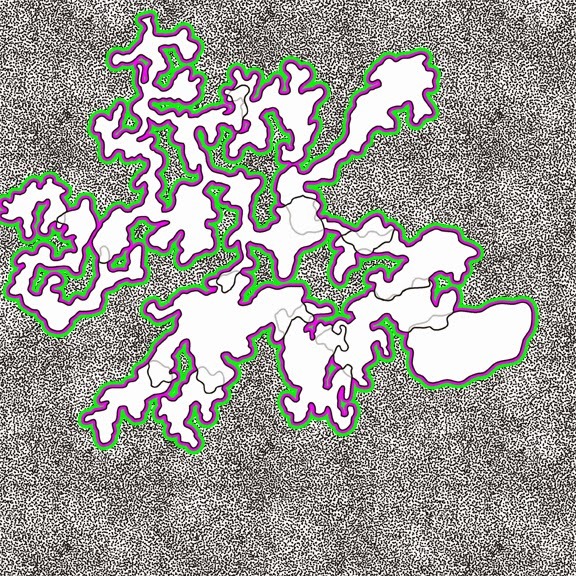 You should end up with a new layer of stippling that is following the contours of your map. At this point I rename that stippling layer (I use "Heavy", "Med", and "Light"), hide it, and delete both the heavy stipple layer (the one covering the whole page) and the stroked cave layer with the loud color. I start the process over again with the Medium and Light stipple files, but on these two attempts I either use a much heavier stroke layer (like 24px for the medium stipple and 36px for the light stipple layer) or what I do is do additional stroke layers with different colors. 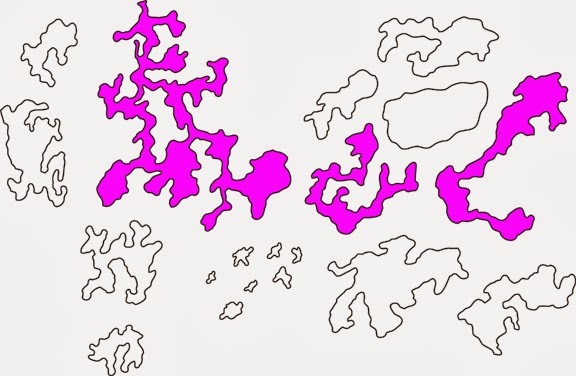 It might be harder to explain, but what I'd do for the medium stipple layer is first stroke out the cave map to something link 10px in one color, and then use another loud color and stroke it out 14px. 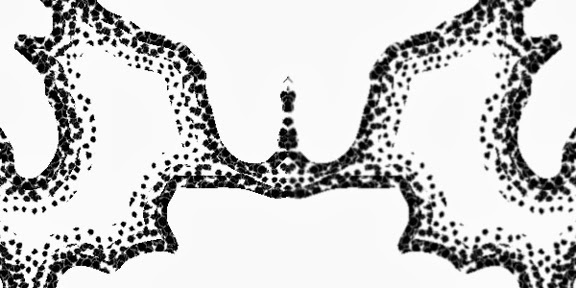 The idea is that the medium stipple layer would not start up against the cave wall, but actually just before the end of the heavy stipple layer. Either way, when you are done with your stipple layers I place them in order from heaviest to lightest so that the heavy layer will be seen over the subsequent layers. Often there is a noticeable line between the layers and even between the wall of the cave and the stippling itself. This line is usually because the copied sections from the stroke layers cut through whole dots, making a clear demarcation line. There are two ways I deal with this. The first is simply by working at a much higher resolution than what the final product will be. When I reduce the file from my working resolution of 600dpi to 300dpi (or even 72dpi for stuff on the web) a lot of these issues get smoothed out. The other way I handle this is simply by blurring the stipple layers a little bit. Often just two applications of the standard Blur filter are good enough. It is important to note that if you do not overlap the stipple layers to begin with this border effect is more pronounced. Creating this stippling is in all actuality pretty darned easy if you already have a file of stippled dots. It has taken me easily 3 or 4x as long to type how to do it out than it took to just create the stippling layers to begin with. Now with that done I will generally make another copy of the base cave layer, blur it a couple times also, and place it between my stipple layers and the base cave map layer. Sometimes this helps with the initial border line between the cave layer and the heavy stippling layer (or beginning of the stippling layer if you've merged them). Now all I have to do is combine my layers, maybe add a little logo/copyright mark, reduce the resolution to the appropriate level, and publish.